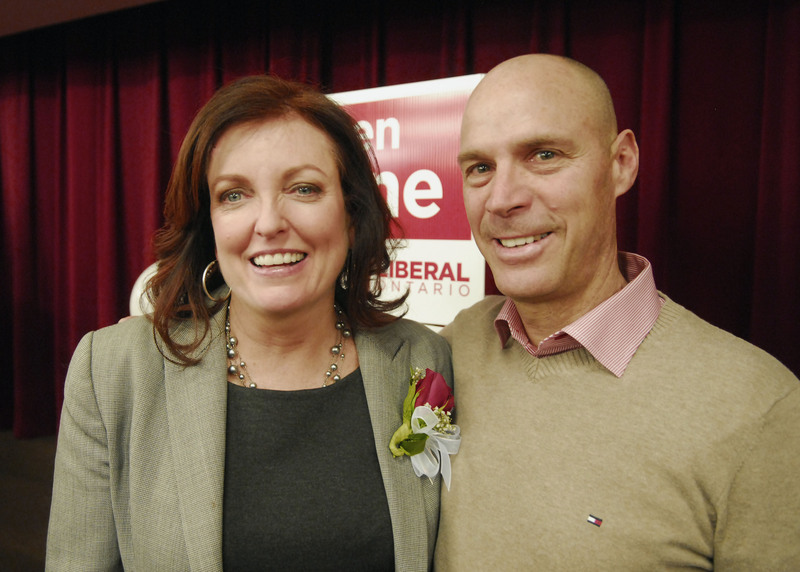 Liberal candidate for MPP Eleanor McMahon and cycling legend Steve Bauer at her nomination meeting on January 30, 2014. All signs point to a spring election in the province. This is exciting for a few reasons. Eleanor McMahon is one of those cycling-friendly candidates, and she's running for the Liberals. Her nomination was announced on January 30, 2014, at the Burlington Central Library. McMahon, who has had a long career in politics – she was press secretary for Chrétien and is founder of Share the Road cycling coalition which has lobbied provincial parliament for safer cycling, just to name a couple of highlights – is now officially taking it Queen’s Park. But first she has to unseat Conservative incumbent Jane McKenna. Burlington has voted Conservative provincially since 1943. We at dandyhorse magazine have every faith that McMahon can and will move a progressive agenda forward that will include cycling. After seeing her in action over the last many years in the cycling community, developing important initiatives like “Greg’s Law” and a 3-foot safe passing law (set to be finalized at Queen’s Park this year), the Ontario Bike Summit, and the Youth Bike Summit, and also moving forward Ontario’s first cycling strategy in years – we are looking forward to a spring election and hope the residents of Burlington are looking for a straight shooter who gets results. And, as you can see from the 100-plus crowd at her nomination meeting in the Burlington on Thursday night there are a lot of other people looking forward to working with her too. The Right Honourable John Turner was among her supporters. 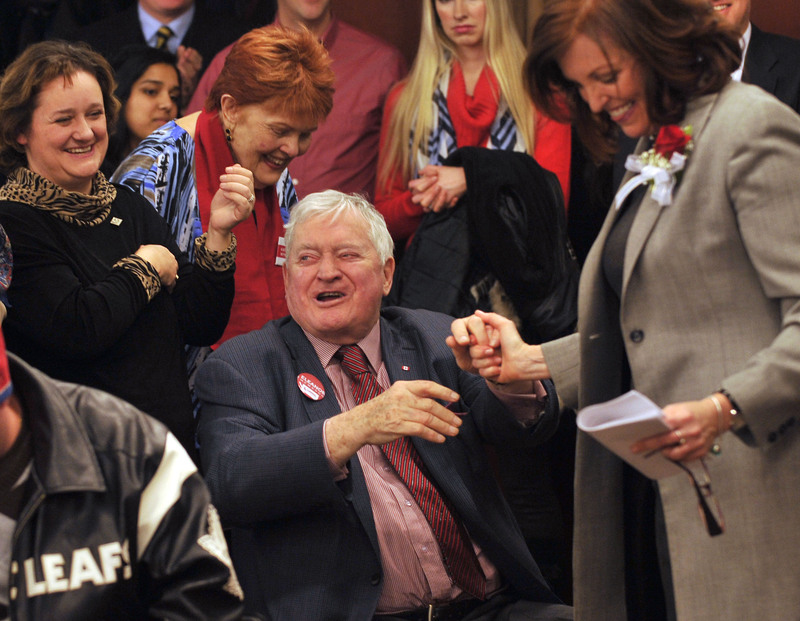 Former prime minister, John Turner, congratulates Eleanor McMahon on her nomination. Premier Kathleen Wynne welcomed McMahon into the Liberal fold, along with transportation minister Glen Murray and minister of municipal affairs, Linda Jeffrey. Murray was one of the star parliamentarians at the inaugural Youth Bike Summit, organized by McMahon’s Share the Road coalition last year. If the attendees are any indication, it sure looks like McMahon has the right ministers supporting her to move a cycling agenda forward in the province. McMahon says cycling is a positive activity that can contribute to healthier communities all across the province. To that end she’ll be helping to organize at least five regional Bike Summits this year, in places like Ingersoll and Thunder Bay, as well as adding eight university summits into the mix for 2014. McMahon says, key to moving the active transportation agenda forward is recognizing that cycling issues are not partisan issues. She’s worked with Conservatives (Norm Miller on the 3-foot passing law) and NDPers (Cheri DiNovo on “Greg’s Law”) to get results. So do we, Eleanor, so do we. dandyhorse magazine will present our special bike plan election issue in June. Stayed tuned to the dandyBLOG and @dandyhorse on Twitter and Dandyhorse Magazine on Facebook for more news. "Photographers deal in things which are continually vanishing and when they have vanished there is no contrivance on earth which can make them come back again." ~ Henri Cartier Bresson. Simon Wilson has devoted his career to chasing the vanishing. An award-winning photojournalist based in Hamilton, Ontario, Wilson's work has appeared in major international publications ranging from The Washington Post, The Times of London, The Globe & Mail, Macleans and the Toronto Star. For over 20 years, this sought after photojournalist has honed his skills at catching not just a record of the moment, but the essence of it.